If you see a LOT of diamonds on a men's Hamilton watch then your "franken radar" should be piqued as the watch may be a jeweler-cased "jobber". A jobber is a watch where a jeweler recased a Hamilton movement in a private-label case with a bling-ed out dial. If it looks a little over the top with diamonds, it's likely not an authentic model. Jobber watches are worth only the sum of the parts... a movement, 14K gold case (if real) and the diamonds (again, if real). You see jobber models all the time with ladies diamond watches. The best way to spot a jobber is to look at the inside of the case back - if it doesn't say Hamilton Watch Co, Lancaster PA - then it's not an authentic model. That said, there are a number of authentic Hamilton watches with diamonds on the dial. They can be very attractive models and worth a LOT more than the sum of the parts, depending upon the model. 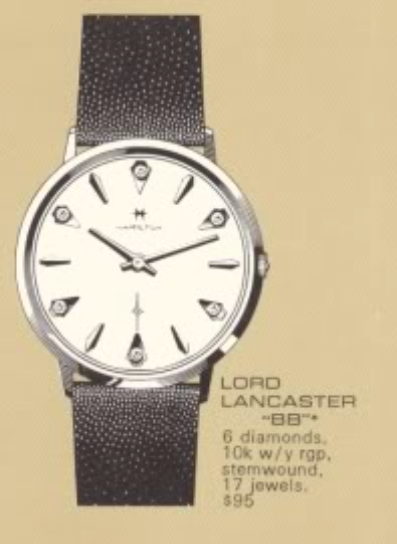 Many of the diamond watches are in the Lord Lancaster line from the 1960s - although there are diamond dialed models from the 1940's and 50's too. One of the last Lord Lancaster models to be introduced is the Lord Lancaster BB. It was introduced in 1968 and produced until the end of US production in 1969. All of the Lord Lancaster models come in a minimum of a rolled gold case... sometimes they are gold filled or even solid gold - but never stainless steel. They are often white in color but some models came in yellow too. They also are often diamond-dialed versions of similar models without diamonds on the dial. The Lord Lancaster BB came in a 10K white or yellow rolled gold plate case. The radial-finished dial is outfitted with matching markers with diamonds on the even-numbered hours. Tucked inside a BB is a Hamilton 639 movement, which was made by Buren (it's a Buren 280). Hamilton acquired Buren in the 1960's and used a lot of Buren movements in their "thin" models... Thinlines, Thinomatics, etc. My Lord Lancaster BB project watch arrived in good shape overall. The crystal was pretty beat up but other than that it was problem-free. Careful observation of the case back reveals that this watch has a one-piece case and will open through the crystal. The Hamilton 639 looks like some of the other sub-second movements from the 1960s. The main difference is the 639 is VERY thin. There isn't a lot of clearance inside between overlapping parts. Notice the male stem. That's a little different too - most other movements have the female portion of the two-piece stem on the movement side. The corresponding female part of the stem is installed in the crown. The inside of the case back has several marks from past watchmakers... the latest appearing to be from 2001. While everything is being cleaned I will prep a new crystal. This one is just a smidge too small so I will have to order a slightly larger size. The printing on this GS Crystal package means the contents are a PK-style (low dome) round crystal with a diameter of 29.3mm which is a 26-1/4 size in GS units. I'll need to order one more like 29.4 or 29.5 for a perfect fit. Everything is cleaned and dried before being reassembled with fresh lubricants, several different oils & greases are used in various places. The reassembled movement goes onto the timer... it's running a bit fast but I can slow that down easily. The Buren 280 has a moveable Hairsping stud so I can adjust the beat error fairly easily. You can see I moved it in the wrong direction on the right side of my display as the two lines separated. As they got closer together the beat error was reduced. The timer wrapped from the right side of the screen over to the left side and I left the balance as is with a beat error of 0.8ms. A new teju-lizard black strap completes the restoration of this very nice looking Lord Lancaster BB. Once I get a tighter fitting crystal the watch will be ready for wrist time.